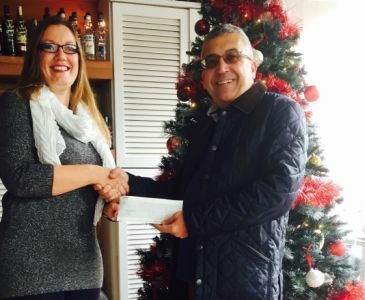 Ms Anne Cadle on behalf of the ‘Friends of the Captain’s Table’ in Xlendi Gozo presented a donation towards Cancer Research through the RIDT. The donation of €685 is the result of a fund raising event held at the Captain’s Table Wine Bar and Restaurant last October. A similar amount is being donated to Breast Cancer Care UK. Friends of the Captain’s Table consist largely of British ex-pats in Gozo, and their Maltese friends.